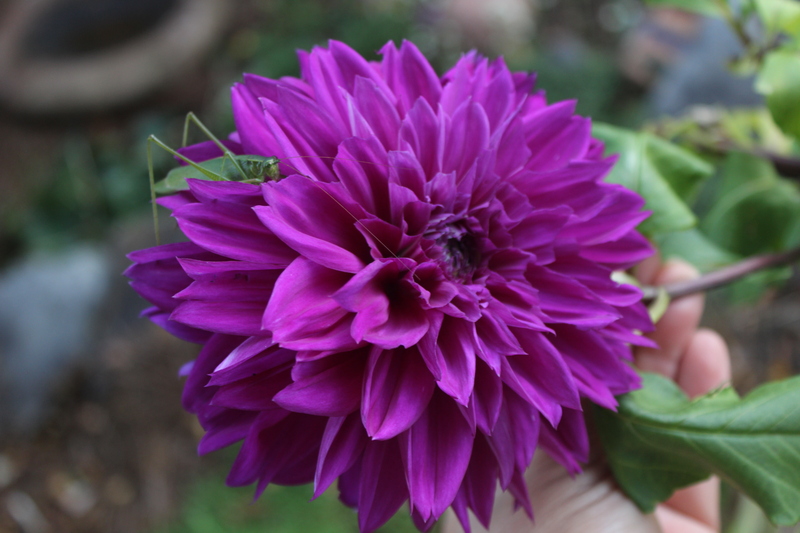 Infrequently, we find a freak in the garden. The latest was found yesterday. I mean an irregularly formed flower. 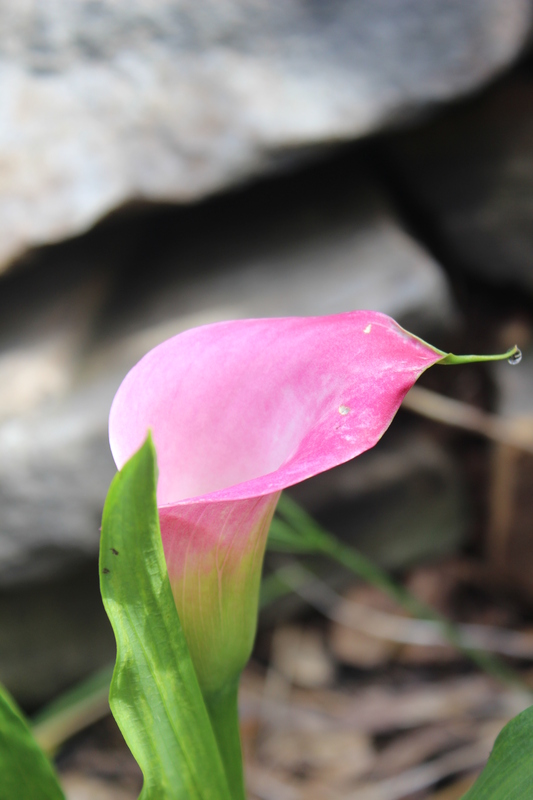 Sometimes calla blooms curl down as they get heavy with seed or full of water. A normal bloom looks like this from the top. A folded spathe around a spadix. I went to stake a droopy Hot Chocolate bloom back up and found a surprise. 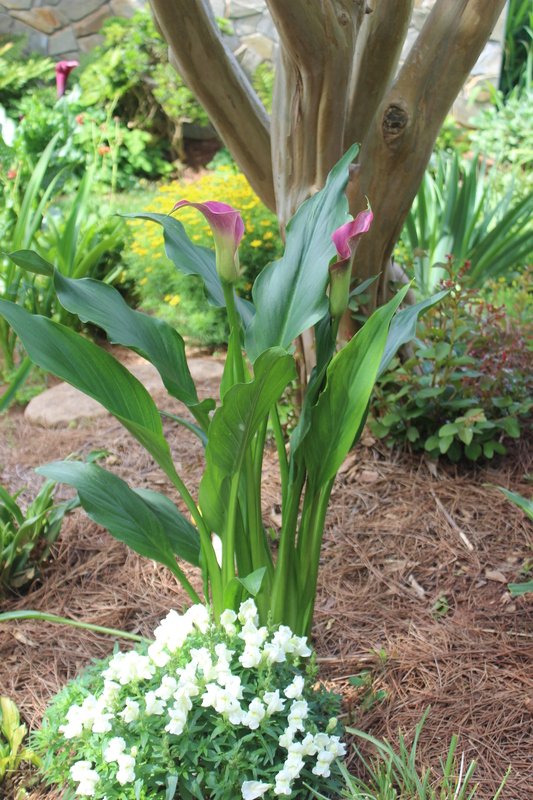 The bloom included a double spathe. FLOWER loves her freaks, too. 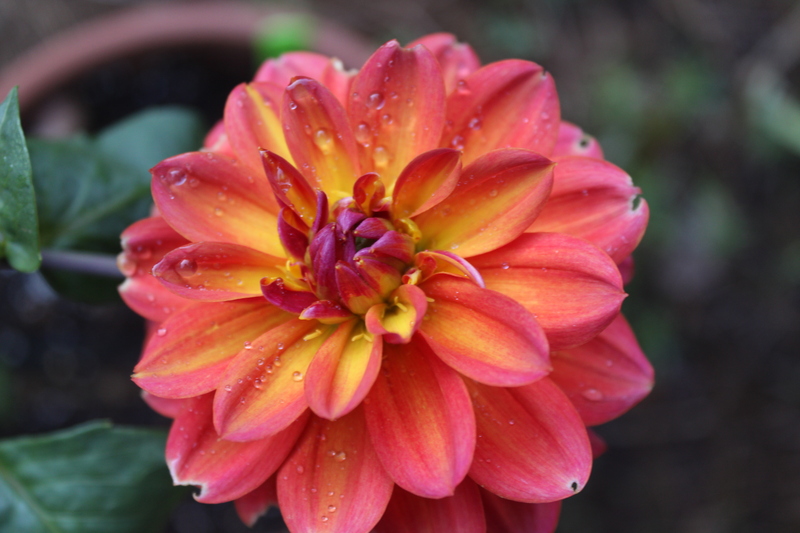 This is one of my very favorite plants in my garden. I have many clumps of them around my gardens. Most are located in partial sun with good drainage. I leave them out over the winter here in Zone 7. 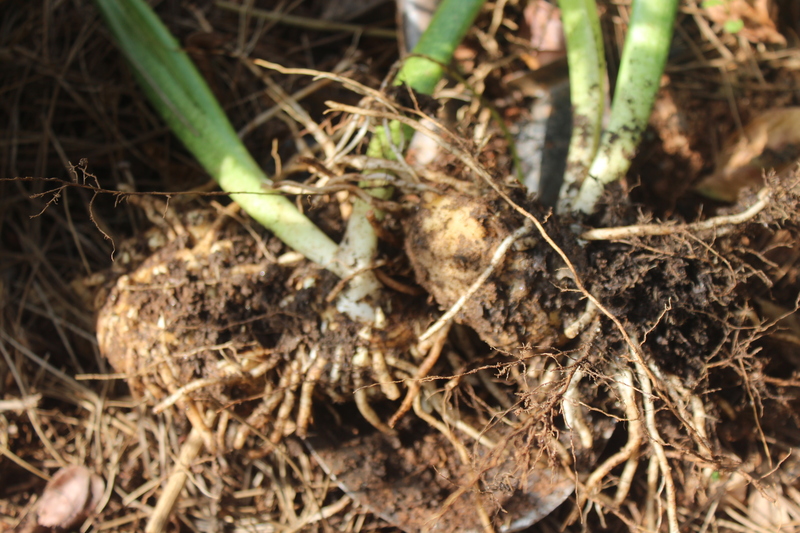 I did dig up dozens of round rhizomes last fall to share as gifts at a Christmas gathering. 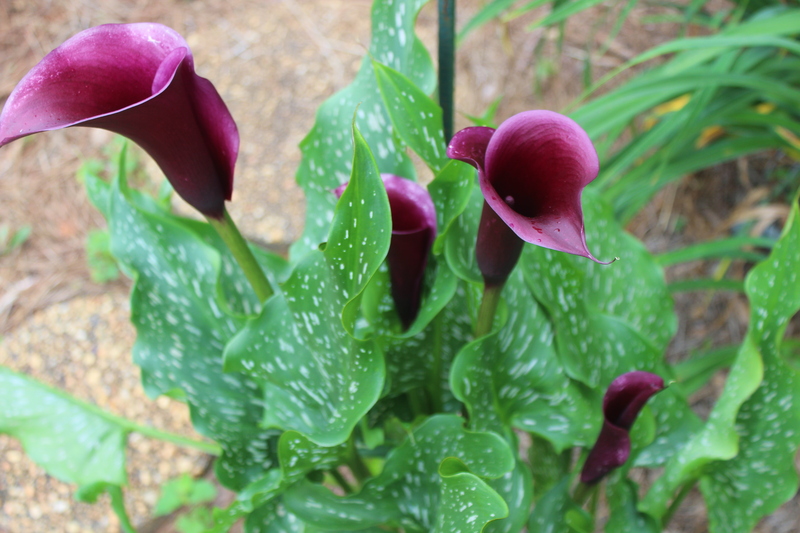 The deep, dark burgundy blooms look almost black in low light. 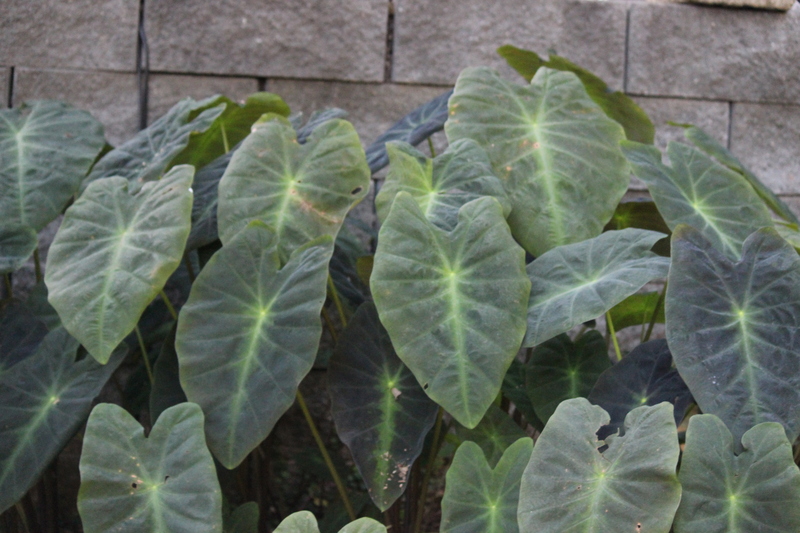 The bright green leaves have clear streaks that appear silver. Their 2′ to 3′ height means they fit in well as the second or third line back in a bed. 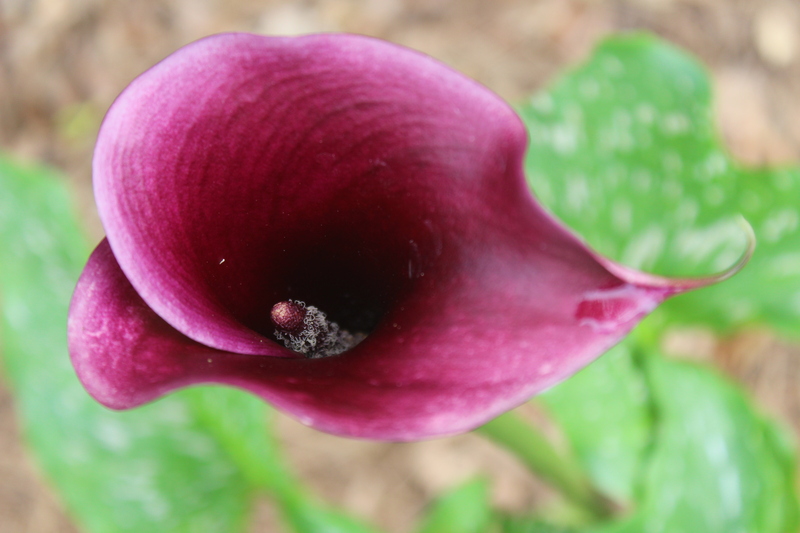 The spathe and spadix blooms have a lovely shape from any point of view. 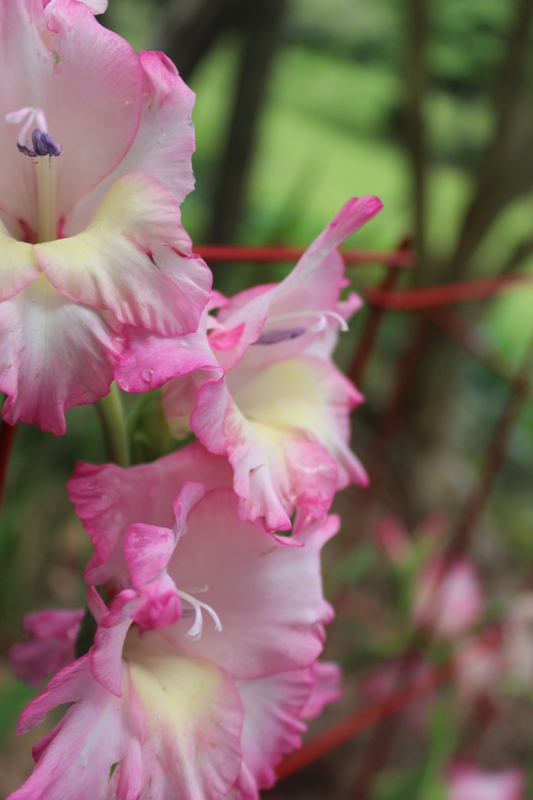 The blooms rise above the leaves and stand out on their tall stems. 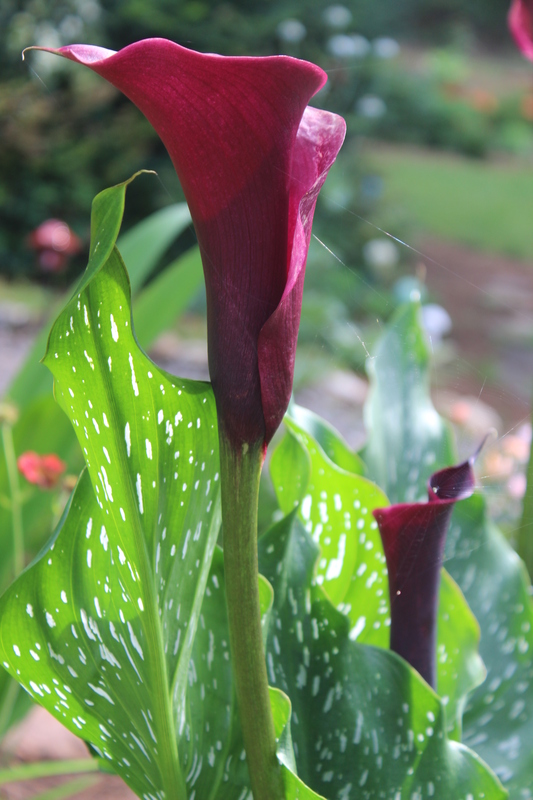 I have several other callas which will bloom later. Hot Chocolate is by far my best bloomer. These Zantedeschias are stealing the show away from the daylilies this week. 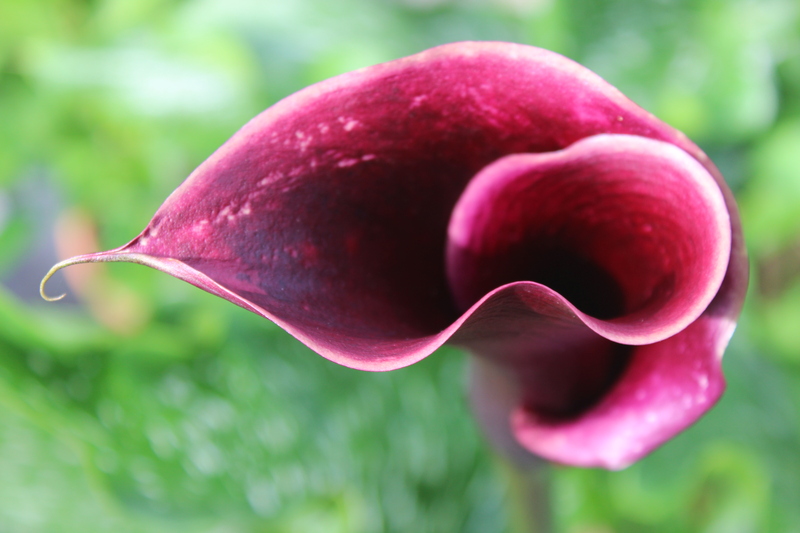 Calla is the Greek word for beautiful. They are living up to their name. 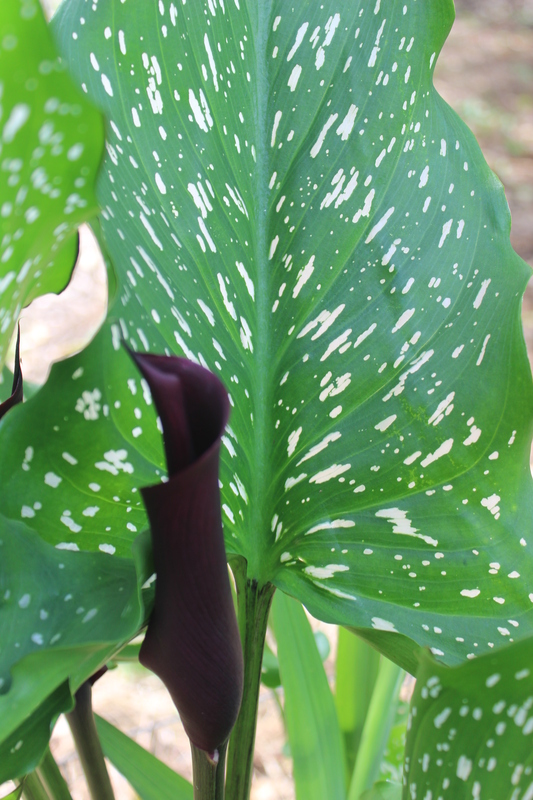 and spadix with tiny blooms. 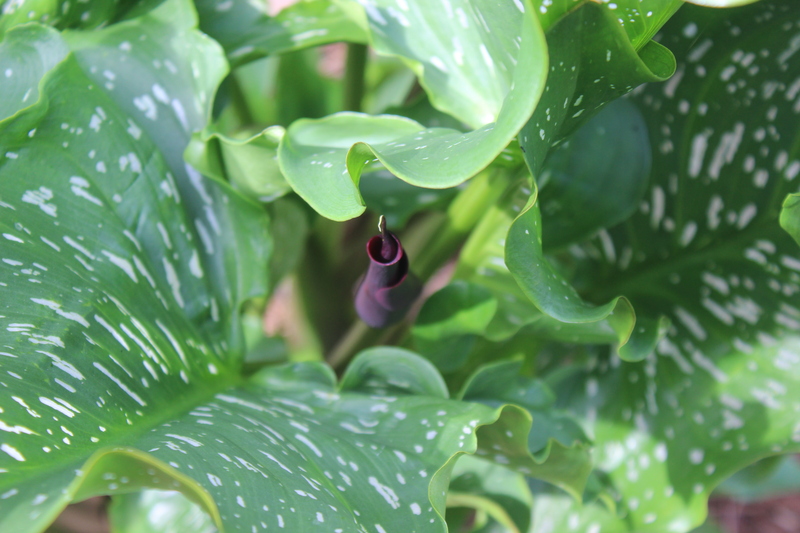 The point on the spathe holds a drop of dew in the morning. 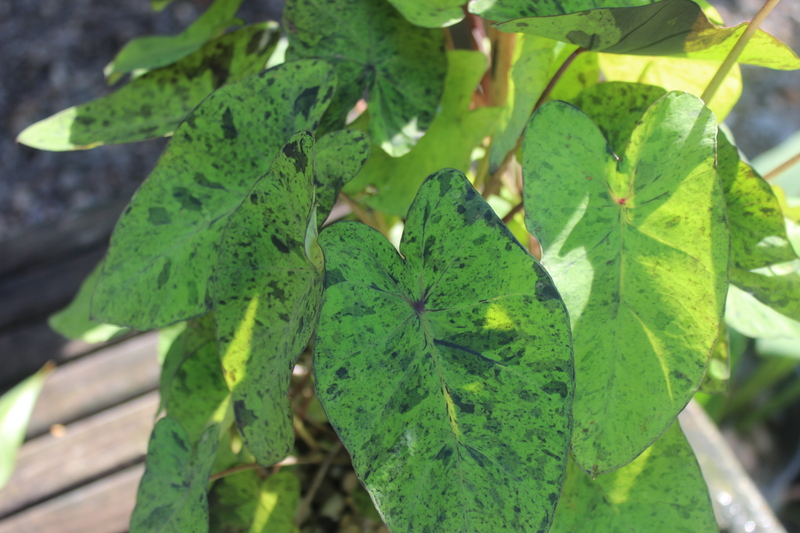 The variegation of the ‘Hot Chocolate’ leaves looks silver and is really clear spots in the leaves. 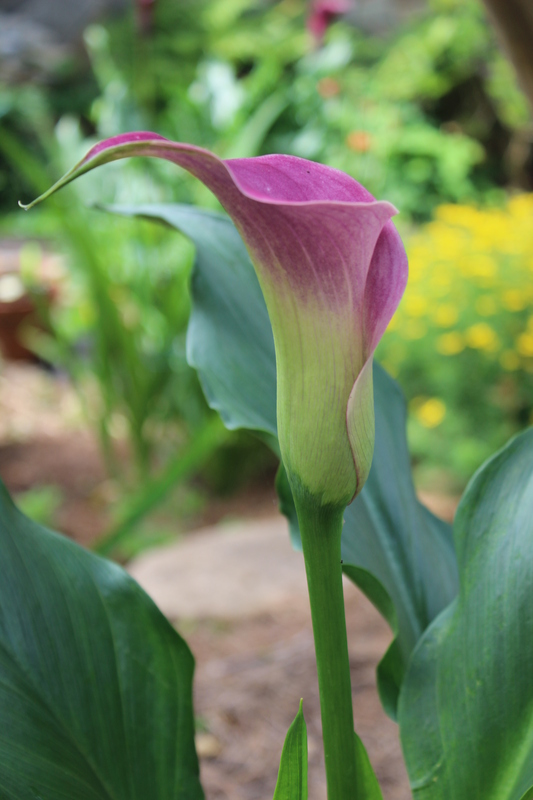 The colors of the spathe of ‘Captain Romance’ shift from green to pink. These are not really lilies and they don’t come from bulbs. 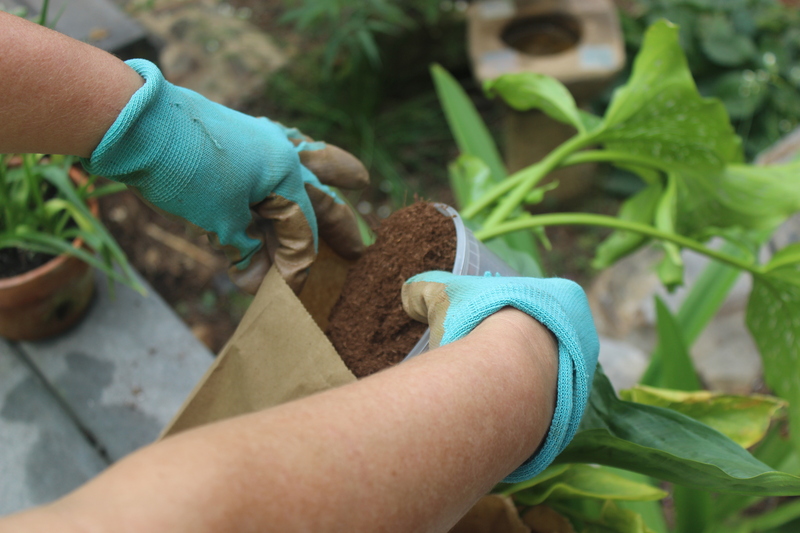 Their round rhizomes are poisonous, so be careful where you store and plant them. I always take a few in over the winter, but leave most of them out. I am in zone 7.